Yes, yes, I know, the iguana on this page looks like he’s on drugs. 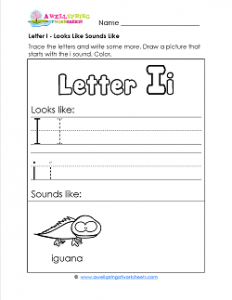 It’s an opportunity for kids to tackle this letter i looks like sounds like worksheet with an attitude of “I can do better than that!” Go for it! Kids first trace the uppercase and lowercase Ii. Then they can write some more. Now for most of the letters I suggest writing three more, but since the Ii is so skinny, your kids can write five to six each. Draw a picture of something that starts with I and finish it off by coloring.